Among the more than 30 kinds of rattlesnakes, the South American species ranges from the Mexican border well down to Argentina. This 6-foot rattler shows the normal blotches along the back but has these fused into a series of stripes along the sides of the neck. These stripes are emphasized when the animal assumes its defensive coil, during which part of the body is held off the ground ready to strike. 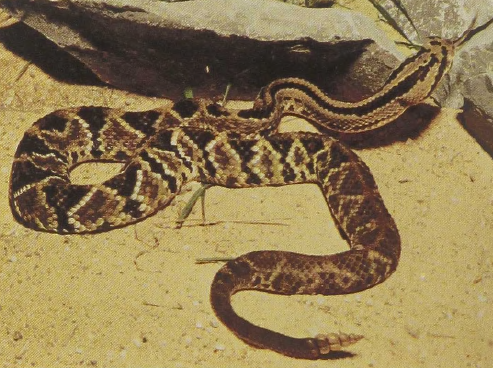 Almost all the North American rattlesnake venoms primarily attack the cells of the blood and the lining of the blood vessels, destroying tissue. The South American Rattlesnake, in contrast, has a venom drastically different from that of most other rattlesnakes in that it contains a nerve poison that paralyzes the muscles.